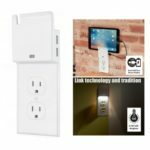 Say goodbye to fumbling in the dark with this AIAWISS Smart Wall Outlet Plate! 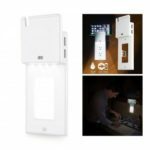 It is equipped with a built-in infrared motion sensor and an ambient light sensor. 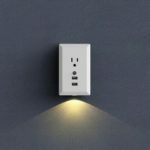 The light switches on automatically when there is movement around, brings great convenience to your daily life. With the design of dual USB 2.4A charging ports, you can charge two USB electric appliances in a high speed at the same time. 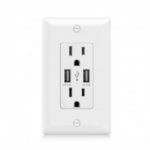 Charge devices simultaneously through one AC outlet and two USB ports, providing superfast-speed charging. Avoid heating up like standard night lights, no open bulbs or glass for kids to burn and cut themselves on. Sleek design, you won&apos;t have to leave space between the wall and your furniture, your room will always look tidy and neat. Back and side wired for easy installation. No batteries or special connections required. USB Compatible USB1.1 / USB2.0 / USB3.0, Phone, Pad, Pod, PDA, MP3 etc.